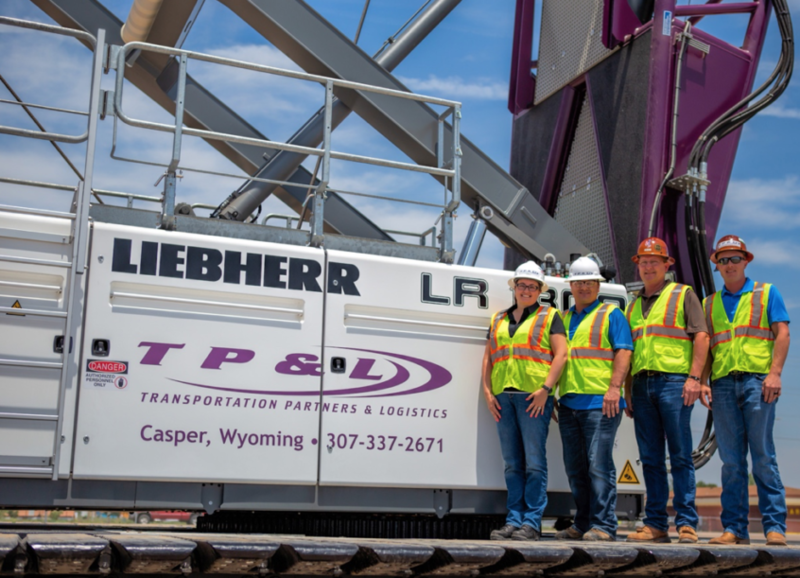 June 18, 2018 – Casper, Wyoming – Transportation Partners and Logistics, LLC (TP&L) announced today that it has acquired two new cranes to further its reach in transporting of oversized and overweight cargo across the supply chain, including wind power and oil and gas projects throughout North America. These new purchases include a Liebherr LR 1300 SX crawler crane for its largest distribution center located in Garden City, Kansas and a Terex HC 285 crawler crane in its Enid, Oklahoma location, which was purchased through Wyoming Machinery Company. These acquisitions come as a result of the company’s visibility into future projects, such as wind turbines, where components are growing in size and will be to up to 62 meters in length as early as next year. Left to Right: TP&L’s Founding Partners and Executive Management Shelli Stacey, Billy Brenton, Jim Orr and Justin Orr with the company’s new Liebherr LR 1300 SX crawler crane. With these recent purchases, TP&L will be able to extend its offload of wind tower components and transformers from rail to truck while in the yard, and will allow for exceptionally large equipment to be moved, stored or delivered to the job site on time. These cranes include jibs that will allow the company to diversify into new industries. 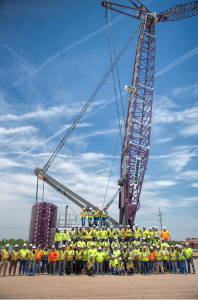 The TP&L Team with the new Liebherr LR 1300 SX crawler crane at the TP&L Distribution Center in Garden City, KS – the largest wind power component distribution center in North America. With recent expansion of its location in Garden City and additional distribution centers in North Dakota, Oklahoma, Wyoming, Colorado and Nebraska, the company serves multiple industries including wind power with rail, port and trucking logistics support and management.